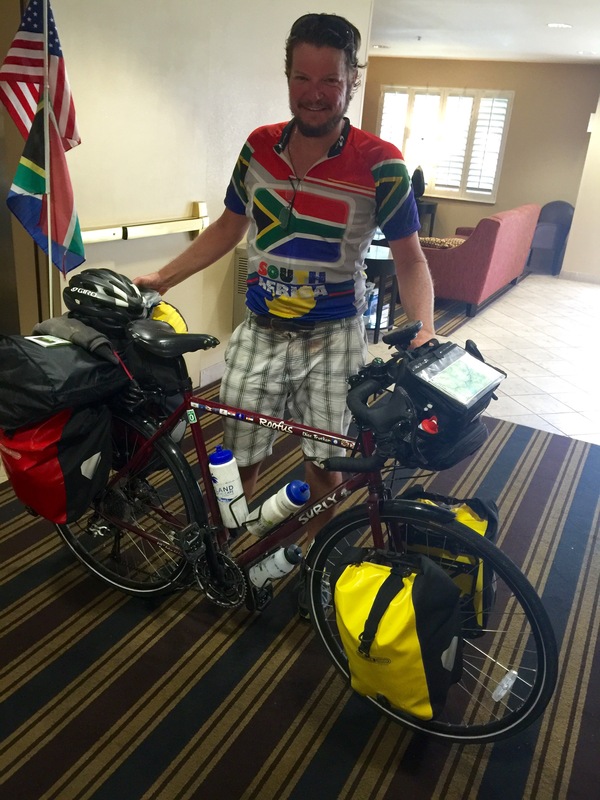 A guy in plaid shorts and a shirt in the colorful geometric patterns of the South African flag, pushed his bike through the doors of the Extended Stay America hotel in Bothell, WA. Bright yellow and red panniers hung over front and back wheels. Three water bottles were attached to the frame. Two flags, South African and USA, on 3-foot tall poles leaned over the bike. “Tomorrow is the last day of my 4200-mile trip from the Washington Monument to the Seattle Space Needle. Ten weeks.” No wonder he looked so happy! He was at the end of his trip. Dave Rens usually works as a marine engineer; he’s also been a scuba instructor. He grew up in South Africa, enjoying a carefree childhood steeped in outdoor activity. Except for short trips to South Africa, he hasn’t been back since 1994, now calling Florida home. On May 31st, he waved goodbye to his two children, Storm and Morgan, officially beginning his journey on June 1st. He had a bunch of new equipment–the bike, navigational aides, and polarized sunglasses with little reader lens so he could read maps or look at his phone. Being from Washington, I was pleased to hear that the last few days of his trip were his favorites, especially mounting Washington Pass (elevation 5477). “The sheer majesty was difficult to capture…it took my breath away,” he wrote in his blog. “Washington State was fighting to be the best on my tour and is winning.” Check out his text and photos at Dave and Roofus Do the TransAm. That’s the kind of attitude that can make anybody a success when mounting an ambitious goal. When I got up to my room, I contacted Seattle’s Channel Five about his arrival at the Space Needle and provided contact information. I left him a meal replacement bar at the front desk because my two oldest sons, Jason and Jules, are associated with PROBAR. Jason has also made the Logan-Boise trip on his bike. This blog and those gestures were the ways I could think to register my admiration for Dave’s ambition. Congratulations are in order, not just for the medalists in Rio.